In the past decade, might-makes-right nationalism has made a comeback like the world has never seen since the 1930s. For now, some of the strongmen are praising and supporting one another – but what happens when the tough guys start fighting among themselves? It was a good week for autocrats. The dizzying stretch began with U.S. President Donald Trump honouring North Korea’s violent dictator Kim Jong-un with a head-to-head summit in Singapore, and ended with Russian President Vladimir Putin — a man the West has spent years trying to isolate — playing the beaming master of ceremonies at the planet’s most-watched event, soccer’s World Cup. Combined with Mr. Trump’s table-upending performance at the G7, it was hard to escape the conclusion that the post-Cold War international system — which developed large cracks two years ago as Mr. Trump was swept to the White House and the European Union began to fracture — has come further unglued. 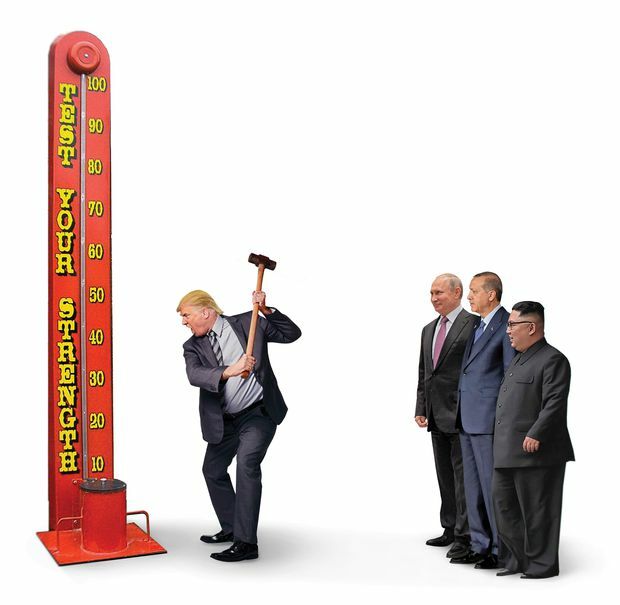 The shape of a chaotic new order is emerging, an era in which might-makes-right strongmen stand tallest on the international stage: Mr. Putin, Mr. Trump, Chinese President Xi Jinping, and Turkish President Recep Tayyip Erdogan, to name only a few. It’s a very different cast of characters from just 10 years ago, before the 2008 financial crisis that launched a decade of turmoil. The new strongmen share a disdain for the rules, and for liberal democracy, and embrace a common concept of patriotism that bleeds into ethnocentric nationalism. We’ve seen this pattern before — economic collapse, followed by the rise of authoritarian rulers — most poignantly in the 1920s and 1930s. Some are concerned that once again having so many “tough guys” in power at the same time — each whipping up nationalism among their supporters — increases the possibility of another conflict between great powers. Witness the proxy war in Syria, where Turkey, Russia and the United States all have military forces on the ground, as well as the gathering trade war between the United States and China. June 8, 2018: Mr. Trump, fourth from left, stands alongside Canadian Prime Minister Justin Trudeau and other G7 leaders at a summit in La Malbaie, Que. What’s clear is that the old system, which saw the West deploy tools ranging from economic sanctions to the threat of military might to get “rogue” countries to play by the rules, has broken down, thanks largely to the disruptors-in-chief, Mr. Putin and Mr. Trump. Mr. Putin, by repeatedly breaking the rules, has made rogue behaviour the new normal around the world. Mr. Trump, meanwhile, has actively undermined multilateral institutions — see his refusal to sign last week’s uncontroversial G-7 communiqué — while simultaneously withdrawing the United States from its long-time role of global policeman. In praising Mr. Kim — a dictator who presides over a system of labour camps and who has used nerve agents and anti-aircraft guns to murder his political rivals — as a “tough” leader who “loves his people,” Mr. Trump made clear niceties such as human rights are not a priority for him. What matters is whether he gets along with the leader of any given country (which can change in a 280-character tweet, as Canada and Prime Minister Justin Trudeau discovered this week). And so we’re left to stare at Mr. Putin’s World Cup triumph: His speech on Thursday welcoming visitors to Russia “an open, hospitable and friendly country” was cheered by the 81,000 fans who packed into Moscow’s Luzhniki Stadium, and watched by millions more around the world. 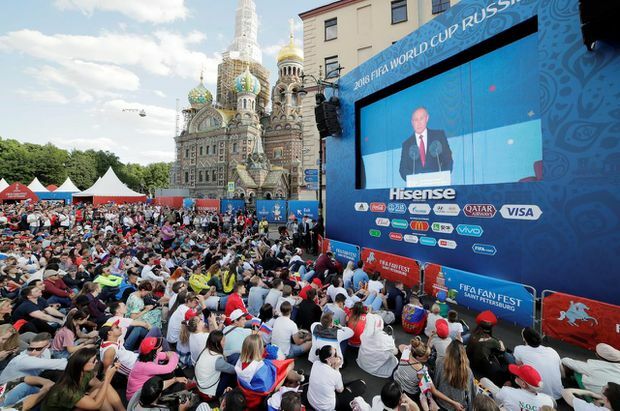 June 14, 2018: At a fan zone in St. Petersburg, Russians watch Russian President Vladimir Putin speak before the opening World Cup match between Russia and Saudi Arabia. The British Royal Family is staying away from Mr. Putin’s World Cup to protest the attack in Salisbury — British Foreign Minister Boris Johnson compared it to the 1936 Olympics in Hitler’s Germany — but calls for a wider boycott fell so flat that it was a British pop star, Robbie Williams, who opened the tournament with a medley of his greatest hits. Mr. Putin watched the Russian team’s opening 5-0 victory over Saudi Arabia in the company of Saudi Crown Prince Mohammed bin Salman, another brooks-no-dissent strongman who has been throwing his weight around on the international stage as he seeks to remake his country and the wider Middle East. Mr. Trump gave Mr. Putin another triumph when he suggested last week that the Russian leader should have been invited to the G7 meeting in Quebec. It didn’t seem to matter to Mr. Trump that Russia had been expelled from the club just four years earlier over the annexation of Crimea, the first hostile takeover of territory in Europe since the end of the Second World War. 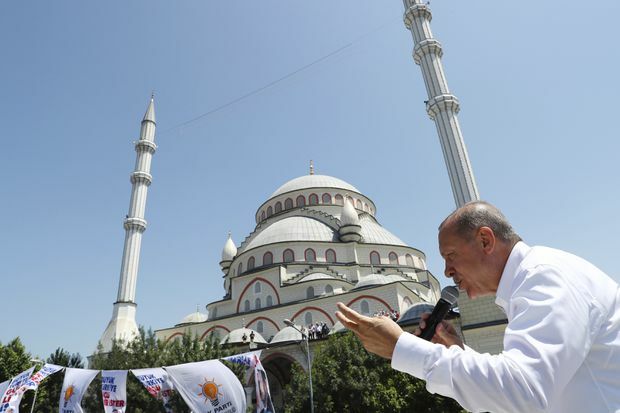 Next week, it will be Turkish President Tayyip Recep Erdogan’s turn to flex in the international limelight if — as is widely expected — he is re-elected on June 24 to another term with expanded, Putin-esque powers. Like the Russian President, Mr. Erdogan has cowed the media, crushed the political opposition, ignored the human-rights lobby, whipped up a dangerous nationalism and emerged as his country’s most powerful leader in several generations. June 15, 2018: Turkish president Recep Tayyip Erdogan speaks at an election rally in Istanbul. It’s striking to consider how much the world has been remade over the past decade. Ten years ago, Barack Obama was headed to the White House to begin his first term in office, full of talk about remaking America’s relationship with the world and ridding the planet of nuclear weapons. The Nobel Committee was getting set to welcome him with a Peace Prize that would prove very premature. The internationalist Dmitry Medvedev was in the Kremlin, with Mr. Putin pushed into the theoretically junior role of prime minister. China’s rise was being managed by the colourless tandem of Hu Jintao and Wen Jiabao. Mr. Erdogan was prime minister of Turkey in 2008, but he was then still viewed by most as a modernizer and a democrat. What a difference a decade makes. At left, in 2009, Chinese president Hu Jintao welcomes U.S. president Barack Obama to Beijing. At right, their modern equivalents, Xi Jinping and Donald Trump, meet in China’s capital in 2017. At a Moscow concert in March, 2008, shown at left, Vladimir Putin stands beside Dmitry Medvedev, newly elected as Russia’s new president. Fast-forward to 2018, at right, where Mr. Putin, once again president, stands beside Mr. Medvedev at the World Cup match between Russia and Saudi Arabia in Moscow. Then came the financial crisis that began in September, 2008. The 18-month Great Recession set in motion a series of destabilizing events — the Arab Spring, the war in Syria, the showdown between Russia and the West over Ukraine, the migration crisis, and the rise of nationalist politicians including Mr. Trump — that are still unfolding. Only German Chancellor Angela Merkel remains from the pre-2008 era, and she finds herself acrimoniously at odds with both Mr. Trump and Mr. Putin, while the European Union — long seen as a bulwark of stability — creaks under the strain of the migration crisis, Britain’s vote to leave the EU, and the rise within the bloc of Putin-admiring populists such as Hungarian Prime Minister Viktor Orban. “We scraped through the  crisis and I don’t think we realized how lucky we were. I think a lot of democratic leaders failed to recognize the sense of alienation and frustration that a lot of people in their own societies had, and failed to deal with it,” said Ms. MacMillan, who teaches at both the University of Toronto and Oxford University in England. Munich, 1937: Adolph Hitler and Benito Mussolini inspect an honour guard during a visit by the Italian dictator to his German counterpart. 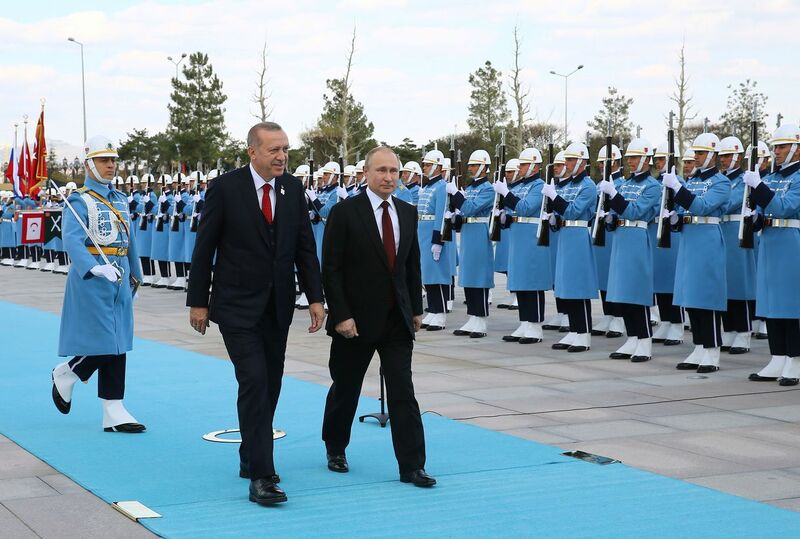 Ankara, 2018: Turkish President Recep Tayyip Erdogan and his Russian counterpart, Vladimir Putin, review a guard of honour during a welcoming ceremony at the Presidential Palace. In the wake of the Cold War, Western leaders frequently spoke of democracy spreading around the globe. Many believed that such an outcome was inevitable. Today, it’s authoritarianism that appears to be hopping from one country to the next as politicians, looking for a formula to sell to their anxious populations, eye the easy solutions that one-man rule — preferably accompanied by a rubber-stamp parliament and a pliant judiciary and media — appears to offer. Turkey’s election next weekend will be the first since a 2015 coup attempt that very nearly toppled Mr. Erdogan. He has since been merciless at home, jailing tens of thousands of perceived political opponents and driving many others into exile. Mr. Erdogan’s Turkey has also been adventurous on the world stage, where it stands accused, like Mr. Putin’s Russia, of seeking to restore the dominion it once held over its neighbours. 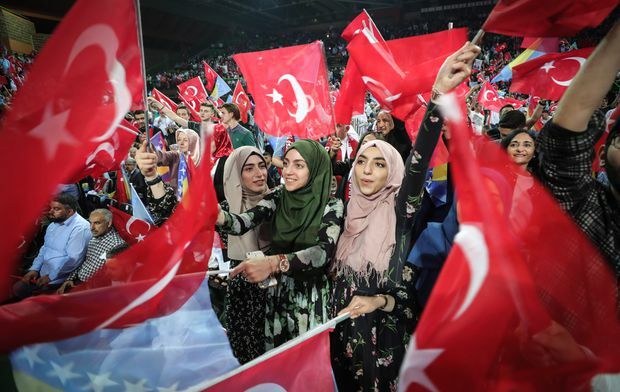 May 20, 2018: Supporters cheer and listen as Mr. Erdogan speaks at a rally in Sarajevo. Like Mr. Putin’s move into Crimea, which recalled Russia’s imperial history and distracted from stalled efforts to reform the country’s economy, Mr. Erdogan’s military adventurism plays well at home. In Turkey, as in Russia, patriotism is increasingly equated with support for the army and its commander-in-chief. After 18 years in power, Mr. Putin has become something of a leader among the strongmen, providing not only a model of governance but also economic, military and diplomatic support to the likes of Mr. Orban, Serbian President Aleksandar Vucic and Venezuelan President Nicolas Maduro. North Korea’s Mr. Kim and Philippines’ President Rodrigo Duterte, meanwhile, defer primarily to their nearest patron, Mr. Xi. But while the new strongmen may admire each other, their ego-driven behaviours also raise the risks of confrontation between them. In Asia, Mr. Xi has made himself into China’s strongest leader since Mao Zedong, clearing away the constitutional hurdles to seeking more than two consecutive terms in office, opening the way for him to remain in power indefinitely. China’s military is also expanding rapidly in terms of its ability and ambition. That growing strength poses a challenge — and potentially justification for copycat moves — to the likes of Indian Prime Minister Narendra Modi and Japanese Prime Minister Shinzo Abe, two other nationalistic Asian leaders who have thus far been constrained by the fact they lead democracies. Battle lines are hardening in the Middle East, too, where headstrong leaders such as Saudi Crown Prince Mohammed and Israeli Prime Minister Benjamin Netanyahu seem to be preparing for a region-wide conflict against the hardline rulers of Iran. The informal Israel-Saudi coalition is already waging a proxy war against Iran and its allies in Syria, a brutal seven-year-old conflict in which Mr. Trump and Mr. Putin also back opposing sides. At the Seoul Railway Station, South Koreans watch a news report on the meeting between Donald Trump and Kim Jong-un in Singapore. 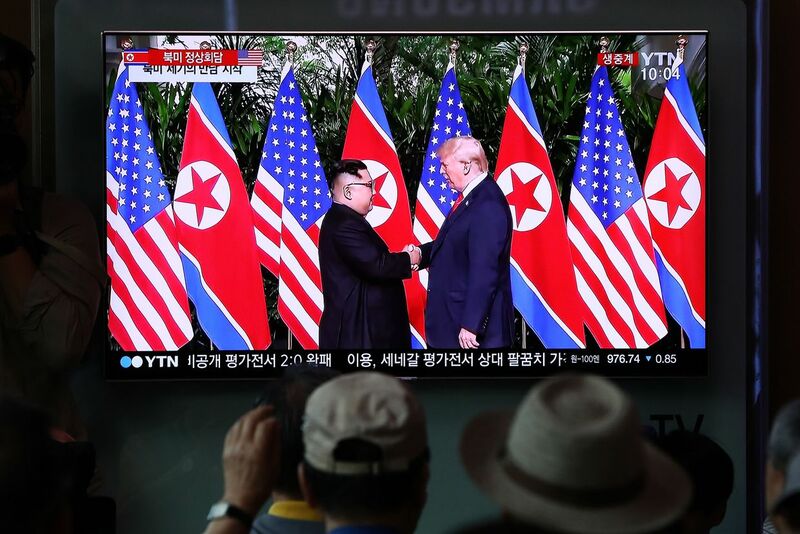 In Pyongyang, North Koreans watch footage of the summit on June 14, when the nation’s state media aired a newsreel on the summit describing Mr. Kim as a leader revered by the whole world. In a time of strongmen, those perceived as weak are often pushed aside, their concerns ignored. 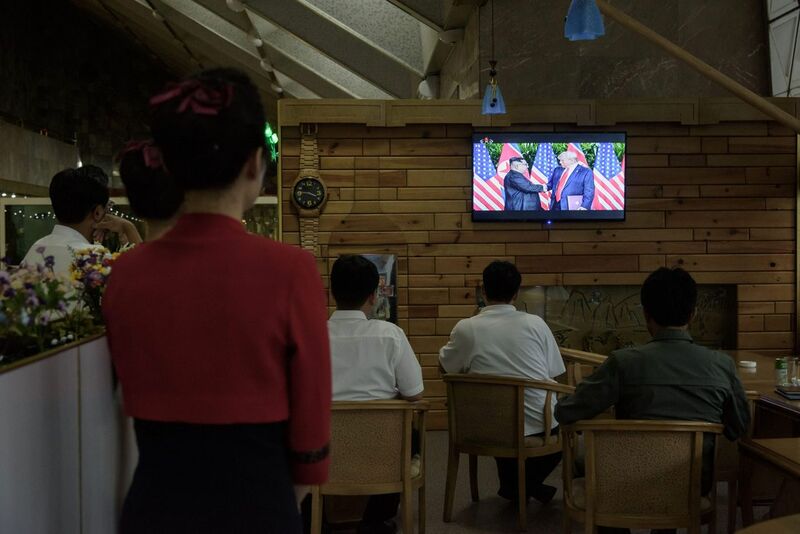 Jihyun Park, a 49-year-old North Korean refugee who survived two stints pulling farm equipment in the Kim dynasty’s labour camps, watched the Singapore summit this week with mixed emotions. On one hand, she delighted in Mr. Trump’s pre-summit mixture of threats and coaxing, which she said had forced Mr. Kim to break with his family’s hermitic traditions and travel — on a plane provided by Mr. Xi — to the Singapore meeting. “It is Trump who made Kim Jong-un come out [to Singapore],” Ms. Park told a panel in London. She hoped that exposing Mr. Kim and his entourage to more of the outside world would help bring change to her country. But Ms. Park, who now lives in the English city of Manchester, said she was angered by the Singapore summit’s narrow focus on nuclear weapons and other military issues, and the near-complete absence of human rights and the well-being of ordinary North Koreans from the agenda. Another Britain-based exile watching global events from the sidelines this week was Vladimir Ashurkov, a close ally of Russian opposition leader Alexei Navalny. Mr. Ashurkov fled Russia four years ago as police escalated their pressure on those close to Mr. Navalny (embezzlement charges against Mr. Ashurkov, a banker, are widely viewed as trumped up). The 46-year-old Mr. Ashurkov said he was happy to see Russia hosting the World Cup because it was a positive outlet for the growing nationalism in his country. “It’s much better to be proud of hosting a World Cup than to be celebrating the annexing of the territory of another country,” Mr. Ashurkov said, referring to the crowds who gathered on Red Square four years ago to cheer Mr. Putin as he declared the formal annexation of Crimea. 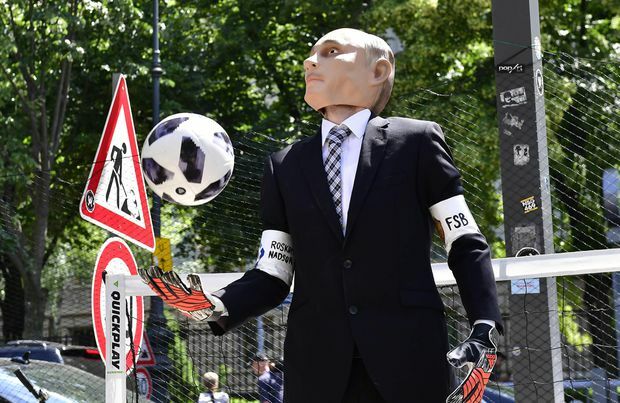 But the month-long soccer tournament is nonetheless another gain for Mr. Putin. “It’s a moment of pride, a moment when he can really boost support for himself and the regime,” Mr. Ashurkov said. An even bigger win looms, he said, if Mr. Trump — who many believe won the 2016 presidential election with help from the Kremlin — and his populist allies in Europe continue to tear down the old, Western-led international system. “Russia and Putin will use any kind of disagreements and controversies within the Western world to try to advance its own agenda … for his game of trying to install chaos in the Western political system, the Western political order,” Mr. Ashurkov said. June 12, 2018: An activist with Reporters without Borders wears a Putin mask at a protest in front of the Russian embassy in Berlin.